Chicago, Illinois. A McDonald’s, like any other. A woman called Destiny Carreno is waiting in line to place her order. The queue’s moving pretty fast, there are plenty of cashiers working. She notices an elderly disabled man wheel up to the counter and speak to an employee. Destiny could see from his badge that his name was Kenny. The customer asked Kenny to help him eat. As the restaurant was so busy, she assumed he’d just politely decline. But no. He shut down the register, washed his hands and went over to where the customer was sitting. 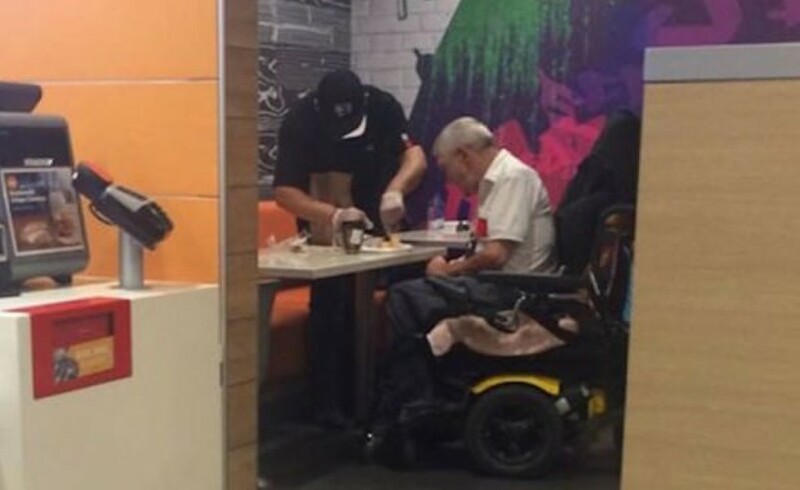 From there he patiently helped feed the man in a beautiful and touching showing of heart-warming generosity and kindness. “Seeing this today brought tears to my eyes! Compassion has NOT gone out of style. Today I made a quick stop at McDonald’s after work. As I waited in line to order, an elderly handicapped gentleman wheeled himself over to the cashier in front of me. From what I perceived, the gentleman may have had a case of quadriplegia, the same medical condition my uncle has. The man politely tried to ask the cashier something and it took him a few tries before either of us could understand he was saying “Help me please”. Neither of us knew what help he needed, and the cashier suggested a few things before he figured out the gentleman needed help cutting and eating his meal. To be honest, I thought the cashier wasn’t going to help, especially during rush hour in downtown Chicago, but to my shock, he shut down his register and disappeared from view…. Not to get away from helping him, but to wash his hands and put gloves on! I had to stick around and see how this would play out, especially since it hit me so close to home with my own uncle. The cashier came out from the kitchen, sat down, and began cutting the man’s meal and helped him eat. At that point, the tears started to gather in my eyes. My heart was so appreciative for what he did. I couldn’t contain my emotions in the crowded restaurant. 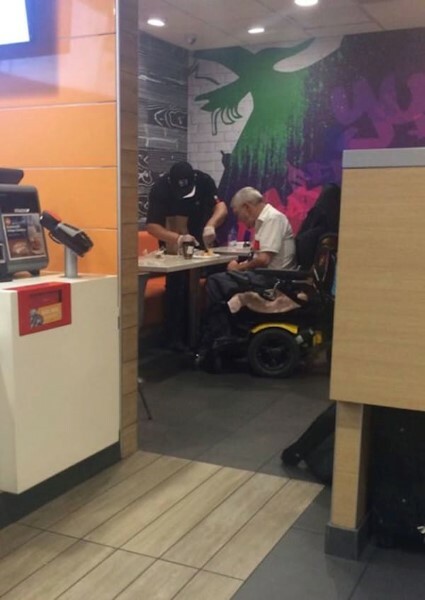 This employee, who put everything on hold for this man, went above and beyond his responsibilities to help this handicapped customer out. That was the kindest and most humble thing I had ever seen. Touching, isn’t it? Oh, and to answer that last question of Destiny’s… 350,000 shares at the moment! Next articleThis Is What Happens When You Eat Garlic In The Morning On An Empty Stomach! The 10 Most Common Nightmares EXPLAINED! #2 Might Just Rob You Of Sleep Forever! Jimmy Fallon And Justin Timberlake Present ‘The History of Rap’ And It’s EPIC! These Are The DUMBEST Ways Anyone’s Ever Died… #2 Is Just CRAZY! There’s a Woman Hidden In This Picture… Can You Find Her?